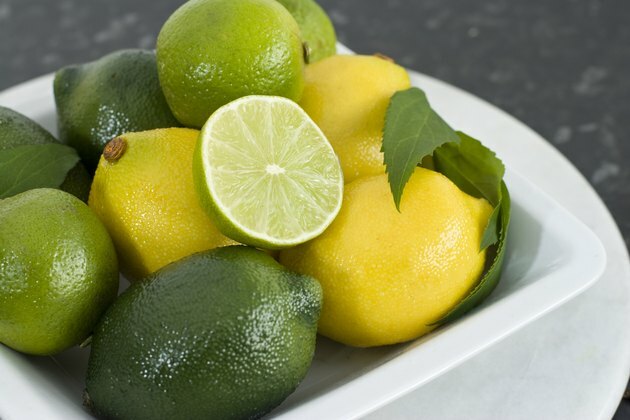 Which Is Better for Your Health: Lemon or Lime? Matthew Lee has been writing professionally since 2007. Past and current research projects have explored the effect of a diagnosis of breast cancer on lifestyle and mental health and adherence to lifestyle-based (i.e. nutrition and exercise) and drug therapy treatment programs. He holds a Master of Arts in psychology from Carleton University and is working toward his doctorate in health psychology. Despite differences in size, flavor and color, lemons and limes share the same nutritional benefits. Both are low in calories and are good sources of dietary fiber, and they help you meet your daily needs for vitamins C and B-9. In addition, lemons and limes contain limonoids, which are compounds that may help prevent and treat cancer. Although lemons and limes both provide these benefits, the higher vitamin C content of lemons makes them a slightly better option. Comparing lemons and limes by weight reveals that the two are almost indistinguishable nutritionally. Both contain around 30 calories, 2.8 grams of dietary fiber and between 2 and 3 percent of your daily intake of vitamin B-9 in 100 grams, which is the weight of approximately 1.5 limes or 1/2 cup of peeled lemon. Although limes contain slightly more carbohydrates and slightly less protein than lemons, these differences have little effect on your daily intake. Lemons and limes are not a source of most vitamins and minerals. However, both contain large amounts of vitamin C and differ greatly in their vitamin C content. With 53 milligrams of vitamin C, 100 grams of lemons provide 71 percent of a woman's and 59 percent of a man's daily intake. In contrast, the 29 milligrams of vitamin C in 100 grams of limes are 39 percent of a woman's and 32 percent of a man's daily vitamin C.
How Many Calories Does a Mango Have? How Many Calories in Fruit Juice?